One frequently asked question is, “Can you make my concrete countertop look like granite?” Our response in general was to be very wary of this customer. But what if this is our ultimate customer? One with enormous artistic vision… One that truly thinks outside the form! With this customer you have the opportunity to create that one of a kind concrete countertop that resembles the look of granite or marble through the addition of recycled aggregates, yet has the “concrete funk” effect. This all sounds great! A truly challenging project, what could possibly go wrong? PSI – This is one of the most important considerations of a potential recycled aggregate for your concrete countertop. Using a low psi aggregate, such as limestone, can be a problem. Why? Because it’s not compatible with today’s advanced concrete mixes that can achieve strengths of 6,000-11,000 psi. When grinding and polishing a high psi concrete countertop surface combined with an aggregate with a low psi, you end up with a depression in the area that contained the aggregate piece. What happened? The dust created through the grinding process has wallowed out the lower psi material and left you with a low spot that your slurry coat will cover, thereby covering any aggregate you had intended to expose. 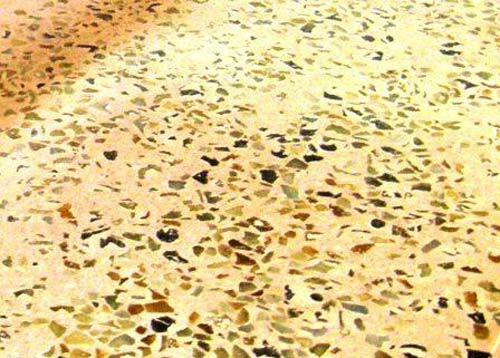 Conversely, a high psi aggregate, such as glass, can leave a “mound” when combined with a low psi concrete countertop mix. The surrounding area around the glass has deteriorated faster due to the dust particulate wallowing away the concrete countertop. Whenever possible try to match high psi aggregate with high psi concrete countertop mix. To be particularly safe wait several days before grinding to ensure the concrete countertop mix cures sufficiently to be able to grind safely. Metallic Objects – Use caution when choosing metal aggergates. Any metal with iron will rust at some point within your concrete countertop. Usually this happens within the first few days and the result will be rust stains around your intended aggregate, and non-payment. What’s the cure? Throw it away, start over, lose days of form work and learn a hard lesson. Flaky or Naturally Layered Aggregates – Mica Aggregates are the main culprit here. Although tempting in beauty and color, use caution in your selection of these aggregates. Your vision may include these gems of the earth, but usually they fall apart when grinding. If they make it through grinding, the sealing process will amplify imperfections, especially using water based sealers. So, did we learn anything? Remember to start simple and experiment. Following some of these princples will hopefully help. That’s the 411 on aggregates for concrete countertops. If you’re looking for a simple bag mix to go along with your choice of aggregates, check out SureCrete Design’s Precast Concrete Countertop Mixes. They pioneer some of the leading mix designs for hybrid GFRC materials to make your precast concrete jobs be much more efficient in terms of materials cost and labor.